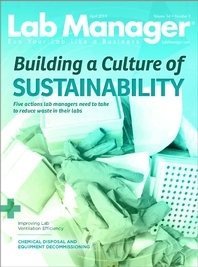 When asked to imagine a research lab, a brightly lit space filled with beakers and microscopes set on top of workbenches, and modular analytical equipment and safety procedure signs lining the walls likely comes to mind. But for Dr. Hazel Barton and her team at the University of Akron, the scene is much different—it’s typically dark and dirty, and usually difficult to access. The Barton Lab at the University of Akron specializes in cave ecosystem research, and uses interdisciplinary tools to answer questions at the interface of biology, chemistry, and geology. Examples of these questions include how microbes live in extremely nutrient-limited cave environments and how to discover novel antibiotics in new environments. The team has also carried out research related to cave formation and fungal systematics. “The goal of our lab is to understand what the limits are for life on Earth,” said Dr. Barton, a cave microbiologist as well as a professor and director of the Integrated Bioscience Program at the University of Akron. Barton has been an avid caver for about 30 years, having explored caves on five continents. Her explorations have been featured in Forbes, National Geographic, and Smithsonian Magazine, as well as on NPR, BBC Radio, Animal Planet, and other major outlets. The Barton Lab team is currently made up of 17 people, including postdoctoral fellows, PhD students, MS students, and undergraduates. While Barton and her students do have a “home base” with a more traditional lab at the University of Akron, they frequently spend days or weeks at a time navigating to sample sites deep underground. The team has traveled to sample sites all over the United States and the world, with some located more than 1,000 feet underground and many miles away from the initial entrance point. “We’ve been lucky in that some of our sample sites are in some of the most beautiful caves on Earth,” said Barton. As she explained, reaching these sites requires a combination of endurance and technical climbing while also making sure to not ruin any of the analytical equipment during the climb to get to the site. But the emotional and physical challenges of caving are what initially piqued Barton’s interest in the activity when she was just 14-years-old. She has made a career out of exploring and discovering things that may have otherwise never been found. What can we learn from caves? The Barton Lab always has numerous projects going on at once, all with specific goals and topics of focus. The research is funded by the National Science Foundation, the US Fish and Wildlife Service, and the National Park Service. 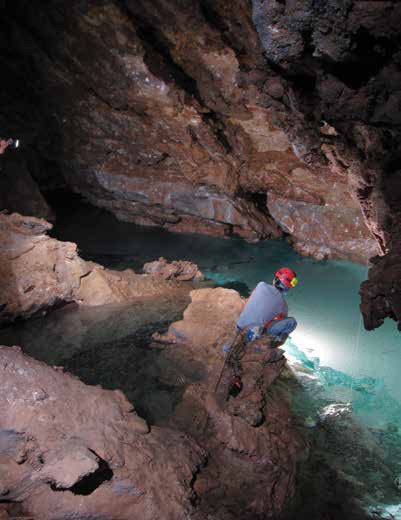 One exciting project currently underway focuses on cave formation in Brazil. An ancient type of rock known as banded iron formation (BIF) first formed throughout the country during the Great Oxidation event 2.2 billion years ago. It is intriguing because it is rich in iron and resistant to weathering and dissolution, yet there are thousands of caves found carved in BIF. Therefore, Barton and her team are studying how microbes may be driving the dissolution processes to form these caves. But reaching these sites, which are often in very remote areas inaccessible to tourists, can be an expedition all on its own. “Getting to the caves is pretty exciting—there are snakes and killer bees and jungles and floods. It’s like an Indiana Jones movie working there,” said Barton. Once the researchers reach the entrance to the cave, they need to carefully hand-carry all their tools, food, and sleeping supplies to the sample site. “These sites are so isolated that we’re often the first humans to ever see them,” said Barton, “and there’s not even enough energy to support protozoan life. It’s really, really isolated.” Sterility is perhaps the biggest challenge for the team. Working in muddy, dark, tight quarters underground is certainly not ideal when trying to re-create a lab environment in a cave. Everything that enters the cave is gamma-irradiated and wrapped in a protective covering to stay sterile. The team also brings plenty of extra tools and gear—as much as two to three times what it needs—to avoid sterility issues and replace anything that may get damaged on the journey to the site. Additionally, all equipment must be compact, lightweight, and battery-powered. The equipment often needs to fit through passages that are less than 20 cm in height. The researchers also have what Dr. Barton calls a “magic box”—on every trip, each student is required to add something to the box that may come in handy, like scissors, tape, needles, zip ties, or sterile aluminum foil. The type of equipment needed on the expeditions can vary depending on the project. Sometimes pumps are required, while other times simple hammers and chisels are needed to collect microbes from rock. Often a Dremel tool is the most useful device. In the field, the team will record geophysical measurements, like pH, temperature, and humidity, and then review the data back in the lab using a combination of genetic, geologic, and materials chemistry techniques. Back at the University of Akron, Barton and her team work with a variety of materials and analytical chemists to carry out chemical identification and other techniques critical to their projects. 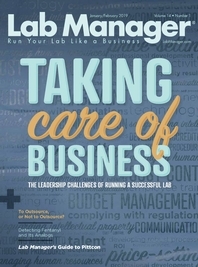 For every week the researchers spend out in the field, they’ll spend about a year completing their research in the university lab, according to Barton. The work often produces unexpected results, and can raise new questions—something that Barton describes as both a challenge and an exciting aspect. “The microbes never seem to behave the way we imagine, so a lot of time we think we know what we’re looking at, and it turns out to be completely unexpected. Being willing to keep an open mind and modify our ideas quickly based on the evidence, rather than trying to make the evidence support our ideas, is always a challenge, but it keeps us on our toes,” said Barton. 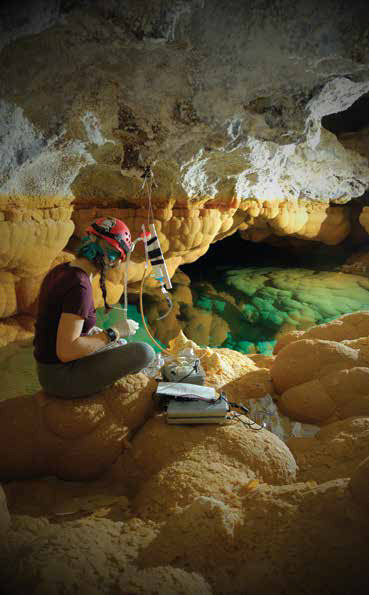 PhD student Katey Bender examines a collected sample in Lechuguilla Cave, New Mexico. This sampling trip required spending four days underground up to 1,500 feet below the surface, involving 22 different rope climbs. 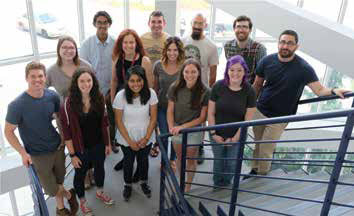 The Barton Lab Team: (front row, from left) David Lowry (technician), Katey Bender (PhD student), Maria Dhinojwala (high school student), Sarah Twitchell (MS student), Olivia Hershey (PhD student), Joe Kainrad (undergraduate student); (center row, from left) Hazel Barton (PI), Kayla Capala (MS student); (back row, from left) Katelyn Glover (undergraduate student), Ashwin Ghatpande (undergraduate student), Ceth Parker (PhD student), Matt Jennings (Post-doc), Charbel Cherfan (MS student). Katey Bender analyzes the microbial community within an isolated lake 1,200 feet underground. Undergraduate student Andrew Wallace, 660 feet underground and several miles from the entrance in Wind Cave, Wind Cave National Park, South Dakota. Wallace is looking at the surface of the Madison Aquifer, which is one of the most important drinking water sources in the US.